“I have always hated to exercise just for the sake of exercise,” my good friend dagdvm once told me. I agree completely. Sometimes it’s hard to just get on a treadmill and walk in place or go outside and walk in circles around some block or track or route or go out a ways and then turn around and come back. Yes, it’s exercise, but walking without purpose can get a bit monotonous. Wouldn’t it be great to have another reason to walk a good distance? It sure does. If you go out looking for certain geocaches you’ll get some exercise without even thinking about it. If you go to a nice park full of geocaches you can walk around for hours having fun finding as many as possible. 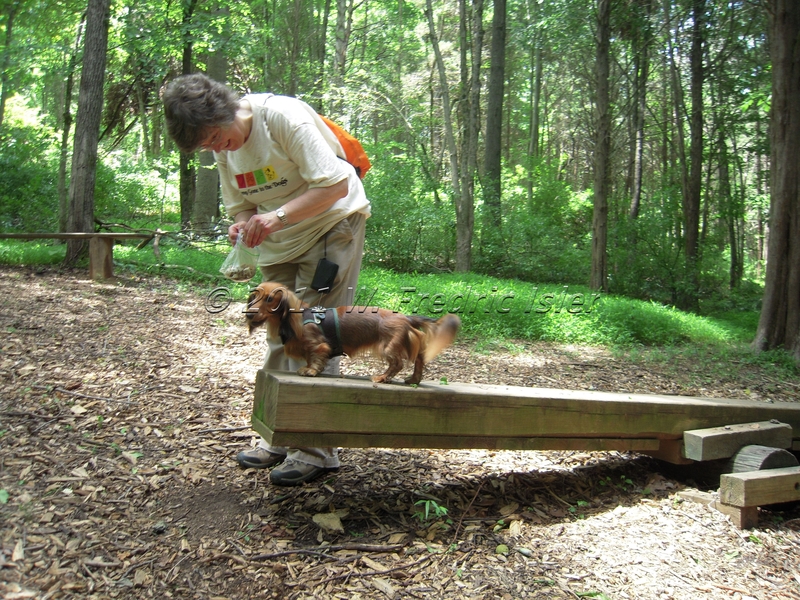 If you go to that park with a friend who belongs to an avid hiking superdog, well — it’s hard to think of a better way to spend a nice healthy day outside, and that’s exactly what dagdvm, her weiner dog Tilly and I did at Hemlock Overlook Regional Park in Fairfax County, Virginia on a fine Sunday in June. 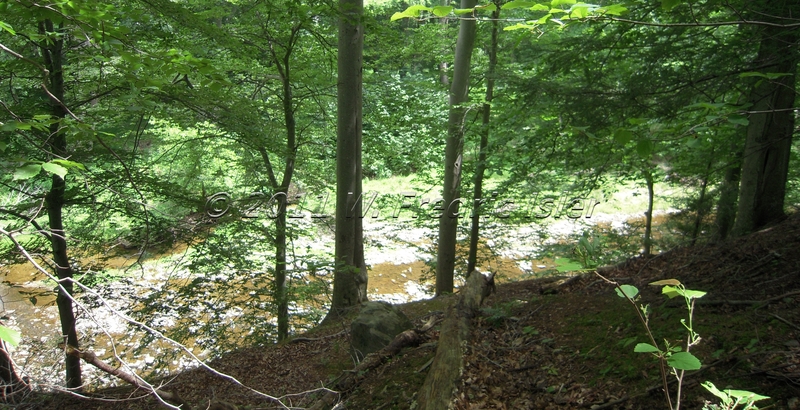 …or you might find yourself looking down at this slow-moving flow from a greater height. 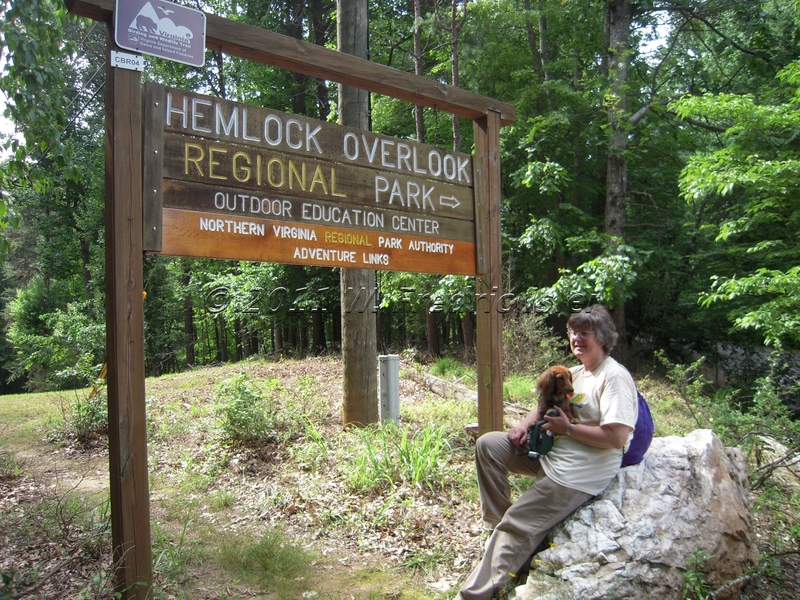 dagdvm, Tilly and I took two loops around Hemlock Regional Overlook Park in search of geocaches. 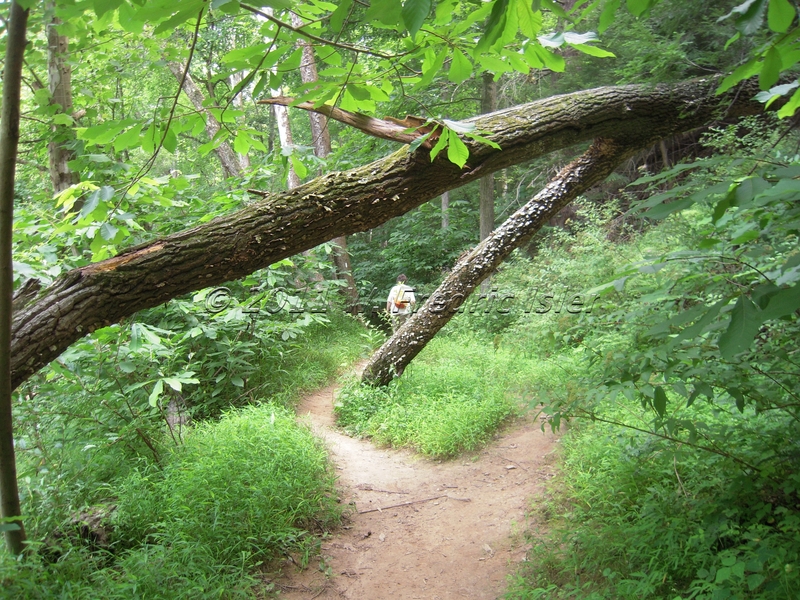 We stayed mostly on the trails for our pre-lunch loop down to and up from Bull Run and found all four of the Henree caches — Henree’s Hideout #1, Henree’s Hangover #2, Henree’s Hollow #3, and Henree’s Hooch #4 — as well as Yellow Horse Hide. After our fifth find we made our way back to the parking lot for a nice lunch break: dagdvm’s PB & J sandwiches and lots of cold water. Peanut butter and jelly never tasted so good. Our after-lunch loop was a bit shorter in distance, still with plenty of ups and downs, and mostly off-trail as we navigated/bushwhacked directly from geocache to geocache. We found Name Your Poison, Lost Vegas, Horse Trail Hide, Squirrel Heaven, and If You Want To Run With The Little Dogs… Terrier. We climbed straight up the side of what seemed like a mini mountain to reach Squirrel Heaven. By this time two of us were completely exhausted but all three of us made it to the top. Our last find of the day, “If You Want To Run With The Little Dogs,” was our most difficult but we hung in there until dagdvm found the hide, making us 10 for 10 for a fine finish to a great day in Hemlock Overlook Regional Park. Two of us were thoroughly exhausted by the time we made our 10th find but Tilly was still raring to go. We hiked and bushwhacked about five miles up and down the sides of those hills and gullies on that hot, muggy Sunday and she looked like she could have gone for another five! The lure of the next cache was a fantastic incentive for us to do just a bit more purposeful walking and all three of us are better off for it. 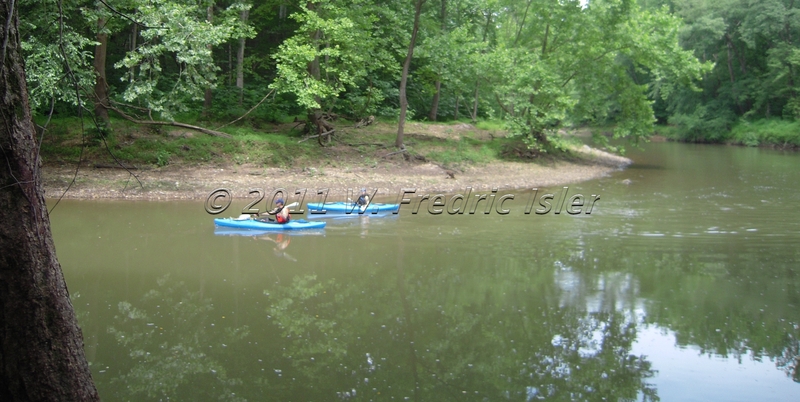 It’s a beautiful thing when friendship and fun get you moving in the great outdoors. 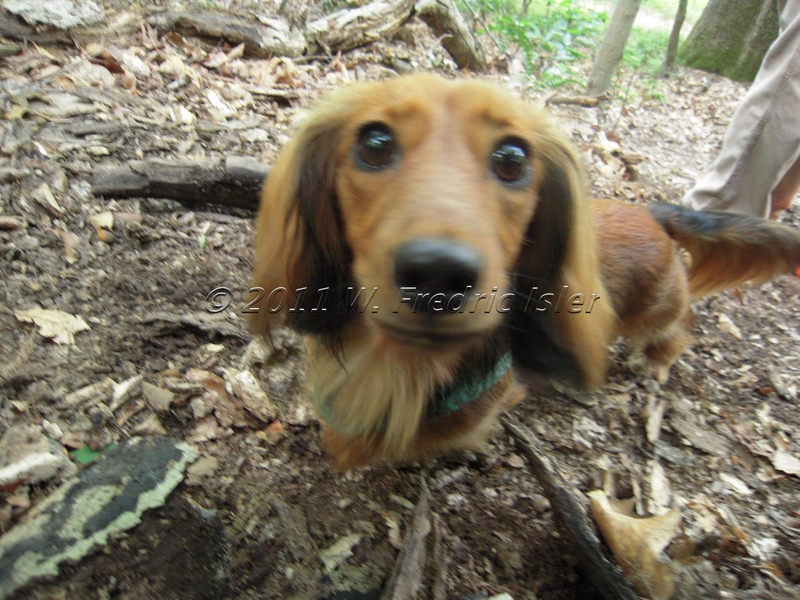 This entry was posted in found it and tagged Bull Run, dachshund, dagdvm, Fairfax County parks, geocaching, Hemlock Overlook Regional Park, hiking, nature, photography, photos, traditional, Virginia, walking. Bookmark the permalink.